Whether your talents lie in writing flowery prose and poetry or clearly describing how to install a computer motherboard, you can find a job as a freelance copywriter. It is completely possible to have a thriving freelance career as a copywriter. Hard copy and online for-profit publications like magazines and newsletters require enticing copy to sell products and services, as do radio and television stations. If you excel at writing convincing copy that makes people spend money, this is a good niche. Textbroker US: This site has numerous short copywriting jobs listed and is a good place for novice copywriters to get started. Upwork: You may need to sift through some low-paying offers here, but there are plenty of copywriting jobs listed that require ad copy. There are a variety of payment methods to choose from, and using a service like this can help you diversify your portfolio quickly. Technical writing is one of the most difficult copywriting jobs and this market usually has the most freelance opportunities. Positions may require the ability to read and interpret blueprints, diagrams and charts and write copy to explain the processes necessary to perform a wide range of tasks from inserting batteries into a remote control device to rebuilding a car engine. Indeed: This job board has a large listing of posts for freelance technical copywriters including agency jobs and those from other job boards. Flexjobs: Offers job postings for part-time and freelance copywriters looking for flexibility, and often include technical writing opportunities. Because people search for so much information to help them do everything from baking a cake to planting gardens, repairing their countertops and hosting children's parties, copywriters who can cover these topics with succinct and clear writing are always in demand. Publishers of educational textbooks also hire freelance copywriters to research and compose copy on a wide range of topics at various educational levels. BloggingPro: The job board on BloggingPro includes a copywriting category that often includes positions for nonfiction or textbook writers. Skyword: This Boston-based content agency frequently hires copywriters to produce content for websites of corporate clients including how-to pieces and short informational articles. Although it can be extremely difficult to find work as a freelance copywriter for movies, books and television, if you happen to have an industry contact that can help you reach the right people, this can be a rewarding career. On a smaller scale, writing copy for traditional and online greeting card companies is a popular freelancing option that can be quite lucrative if you can creatively and quickly produce short verses that evoke everything from tears to laughter, solace and contemplation. Visit these useful websites to search for creative copywriting jobs. Creative Circle: This staffing agency advertises a wide variety of freelance copywriting jobs across the United States. Apply directly by filling out the form on their website. Media Bistro: Use the keywords "freelance copywriter" to focus your job search on the job board of this website dedicated to media including books, newspapers, television, digital media and radio. 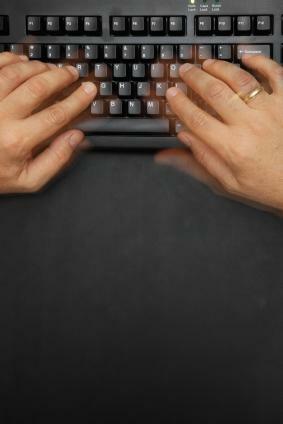 Before taking a full-time freelance copywriter job, try doing it on a part-time basis during evenings or on weekends. Honestly assess your productivity and determine if you have the personality, talent and discipline to earn enough income to give up your regular job.